Why Get a Second Heart Scan? Should I Repeat the Heart Scan? The decision to repeat a heart scan depends upon the reason for scanning and the results of the first scan. For example, if two siblings who share the same family history of early heart disease in a parent, had heart scans, we could make individual recommendations for repeat scans. If the brother had a high score, perhaps he should have a repeat scan in one year to see if his calcium score is responding to therapy. If his sister had a zero score, it is unlikely that will change for quite a while, so her second scan could be done in 3-4 years to make sure, because of the family history, that there is still no discernible plaque found. In general, if your scan results are higher than average or in the moderate range or higher, a repeat scan in a year is recommended by us. It is the only way for us to monitor whether there is progression (worsening), stabilization or regression (improvement) in your coronary situation. Use the Same Type of Scanner! Note: ALWAYS use the same type of scanner for repeat heartscans. 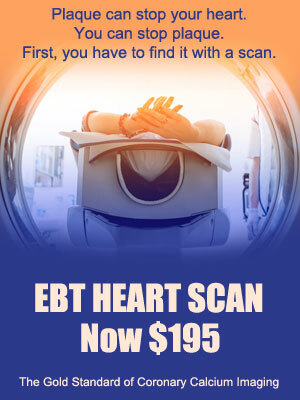 If your first scan was on an EBT scanner, it would be almost impossible for us to make any judgments if your second scan was on a mechanical spiral (helical) scanner…so beware of the differences. 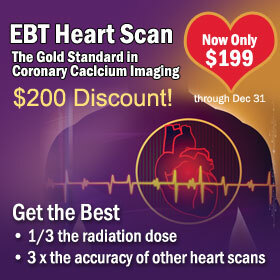 Only an EBT scan has the accuracy to be able to compare scans on a yearly basis. 64-slice or helical scans have so much scan variability, that one must wait about 4 years between scans to get any meaningful comparison data.